These Monitor Stands are Heavy Duty Television Stands! These Inexpensive Monitor Stands for sale with 60" Flat Panel TV Brackets Hold a Lot of Weight! Buy Online Now! 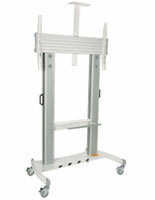 Heavy duty TV stands with locking casters can move and stabilize display! Steel construction is durable for years of use, making it ideal for trade shows! 37" to 60" television of up to 176 lbs. can be displayed on these TV stands. 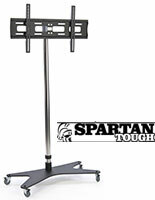 Spartan TOUGH displays are our highest quality stands, made of steel coated in a black powder finish. Monitor stands and other heavy duty television mounts for LCD and plasma televisions are constructed of durable steel making them the longest lasting television stand we sell. These portable flat screen television stands with wheels are extremely durable units that are ideal for use in high traffic areas. The monitor stand for 60" TVs and smaller ship with assembly required but include the instructions and tools needed for fast assembly. This plasma or LCD television stand with casters has a tilt bracket that enables a displayed television to be angled for optimal viewing. These LCD displays, monitor stands, feature a black and chrome finish that brings style to every setting. These heavy duty monitor stands for 60" TVs and smaller with wheels for portability feature locking casters. The LCD television stands are easy to move and room to room for from one event to another. Once in a place, the casters lock to ensure the unit does not move. The flat panel mounts, heavy duty monitor stands with wheels are height adjustable and have a VESA compatible bracket. This VESA bracket hold 37" to 60" televisions that weigh up to 176 lbs. This includes most models of televisions including Sony and LG. These portable heavy duty monitor stands with wheels are designed to mount a monitor in portrait (vertical) orientation only. The long arms of the bracket will be visible if a screen is in landscape (horizontal) orientation. 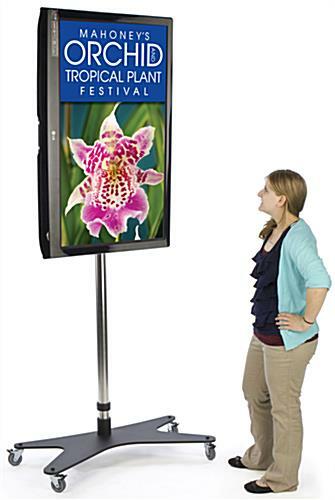 The heavy duty monitor stands with wheels that are found at trade shows are a perfect way to promote your business using a flat panel monitor. The adjustable bracket allows your screen to be placed at different heights to offer the best display! This cheap monitor stand for sale with a 37" flat screen television bracket is one of the strongest models we sell!